(Continued from page 52) which he sketched the curious triangular cartridge of the Dardick "open chamber" gun. 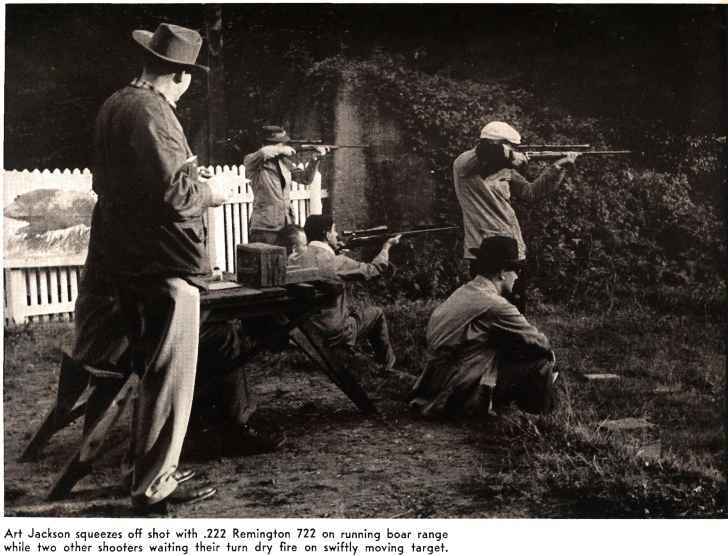 Later, in Washington, I had a drink with General C. T. "Buck" Lanham, then chairman of the board of Colt's, and the subject of triangular cartridges came up again. The trade was excited over the development, although even the name of the man responsible was not known. "Revolutionary open chamber principle" and "make all current firearms obsolete" were ideas expressed by Lanham. If the claims he had heard made for the Dardick gun proved true, the small arms industry would be in for a real face lifting. With all this in mind, it was a real treat, in New Haven last autumn, to discuss with David Dardick and his astute crew of gun-savvy engineers and salesmen the potential of the open chamber principle as it now stands. Watching firing tests of the open chamber device was an added benefit, and I came away impressed with the thought that I'd give a lot—and Dardick would, too —to "see this gun ten years from now." Prototype Dardick guns were mainly to prove the mechanism, which is actually a compact steel subunit inside aluminum "clam shells." More emphasis has been placed on attractive styling in recent pre-production Dardick models. The rumors about the tround construction were more elaborate than the fact. The triangular shape in its present application is to simplify feeding and cartridge stacking. The basic cartridge— originally of aluminum. finalized in Celanese Corp.'s "Fortiflex" plastic—handles a conventional bullet, primer, and powder charge. The primer is set into an aluminum cap adaptor, which in turn seats in the base of the plastic case. This is needed because the elastic case had too much "give" when the primer was inserted directly into the plastic, would cause misfires or hangfires. Externally a triangular prism, the case is cylindrical inside. The aluminum prototypes, some of which actually were so limited in production as to bear serial numbers, had moveable gas-sealing necks which pressed against the barrel breech face on firing, giving maximum velocity from the charge, with no loss or sideflash. With cases made from Fortiflex, side flash is non-significant. I watched experimental firing in the Dardick plant of a rotary breech gun mechanism, in which plain 3 x 5 file cards were rubber-banded on each side of the barrel breech. A charge of 5.5 grains I nique produced instrumental velocity of 882 f.p.s., with no stain or powder marks visible on the cards, under 10X magnification, four or five individual powder specks were visible on the right side card in a thin line, indicating minimum leakage. Significant is the fact the cards were undamaged and appeared to the unaided eye to be white. With an even higher pressure load, 7.5 grains Unique registering 1205 f.p.s. (158 grain .38 Special lead bullet), the cards stayed while and undamaged. By contrast, a standard target revolver with cards placed adjoining the cylinder face, blew the cards to tatters and stained the remaining fragments with heavy powder residue. The load was a standard .38 Special, 158 grain bullet.